With a total of 168 islands and islets in Cebu, the Central Visayas province is blessed with picture-perfect sandbars that are a treasure find for vacationers looking for the perfect summer getaway. This is the first of a series of articles about sandbars located within the province of Cebu. Me and my cousins decided to embark on a late summer excursion and decided to head to a place that is not so mainstream. One of my personal goals is to visit as many islands in Cebu and the Philippines in my lifetime. I suggested we go to an island destination. We were trying to do a budget trip. Therefore we decided against the more popular and expensive places. We figured that the destinations that are not so frequented by tourists would be cheap. We also agreed that there was much to explore in Cebu. So with personal agenda in mind, I suggested Campalabo islet in Pinamungajan. Summoning my convincing powers, I got everyone to agree. The Campalabo sandbar is already being promoted as a tourist destination in Pinamungajan. Yet it was still hard to find information on the internet. This added up to the interest of the group. That's because it has now become somewhat of a mystery. There was also the prospect of being the ones who get to make the destination famous. We planned to leave Cebu City for Pinamungajan early. The calendar indicated that low tide on 23 May 2015 was at 7 a.m. Since we had to drop off a passenger at San Fernando, it further increased our travel time. We left Cebu City at around 5:45 a.m. and reached Pinamungajan already past 9 o'clock in the morning. Using Google Maps, we navigated our way to Pinamungajan. We took the route that passes through Naga-Uling Road. Upon reaching Tajao in Pinamungajan, our next challenge was to look for a boat to rent to take us to Campalabo islet. We initially inquired at the Tajao Seaside Haven Resort. They showed us a package that cost PHP 750 per person with lunch included. We decided against it since we already bought lunch and there might be just too much food we cannot consume. Secondly, we needed to book that 2 days in advance so it was really out of the question. They referred us to Rose Garden who in turn referred us to Park Place Beach Resort. We also inquired at Louie Beach Resort which in turn referred us to a place further down the road marked by a shark mouth as entrance arc. Looking for a boat to take us to Campalabo islet proved to be a challenging adventure by itself. It took us close to an hour to finally reach a deal with a boatman. We settled for the boat parked at Park Place Beach Resort. They charged us PHP 1,500 for a round trip from the Pinamungajan mainland to Campalabo islet and back. We were told that we can probably get rates as low as PHP 900. But we were already pressed for time and PHP 1,500 didn't also seem too much for a group of 6. 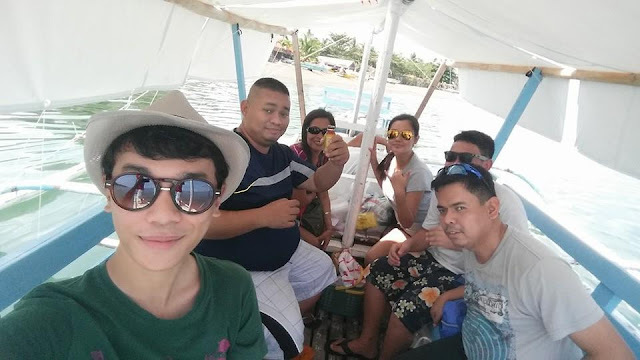 The boat ride from the shoreline of Park Place Beach Resort to Campalabo islet took less than 10 minutes.